BurnAware Professional portable is a powerful CD, DVD and BD disc burning solution intended for users who need maximum control over every aspect of the burning process and use multiple burners for mass-production of various discs and quick creation of disc-to-disc copies. It’s a solid piece of software that will help you cope with your daily burning tasks faster and more efficiently. The program enables users to create data discs (CD, DVD, Blu-Ray, bootable CD and DVD discs) and discs with multimedia content (Audio CD, MP3 discs and DVD video discs). 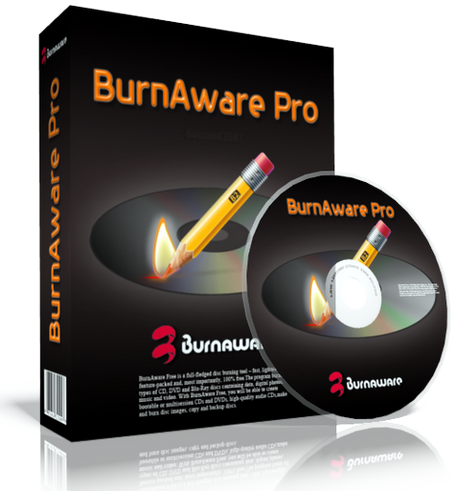 Apart from this, BurnAware Pro will help you create and burn ISO images (ISO and CUE/BIN image files supported), erase rewritable discs, burn multisession discs and even extract specific files from disc sessions and tracks from Audio CDs. A simple and intuitive interface of the program will make even novices feel comfortable with the program features. • Added option to generate MD5 checksum for ISO files. • Added track normalization option to Audio CD compilation. • Two view styles for main window – horizontal and vertical layout. • Updated translations, help file and installer. • Improved time zone handling in data compilations. • Improved burning engine and file processing speed. • Improved support of ISO files in iso unpacking tool. • Improvements to overal program performance. • Resolved issue with displaying file date and time in Windows Explorer. • Fixed bug with cutting file names in ISO compilation with automatic settings. • Fixed bug with copying CD-ROM to CD-R using “direct copy” option.